Just a quick post. Today, I finished the Carpinteria Triathlon Sprint in 1:36:15, not exactly earth shattering, but given the crazy few weeks I’ve had, I think it is just great! Placing 370th of 462 puts me about 20% better than the other athletes. With a goal in 2011 of finishing in the top 50%, I have quite a bit of work to do this winter! The results are posted on the Carpinteria Triathlon website (click “Results” on the left). I took the liberty of plotting the Sprint course overall finish times. The red triangle is me. I wanted to see where I place on the graph and like it. Note how much time is between 1st and 2nd place… a full 8 minutes! That is impressive. A full race report is coming soon… Cheers! 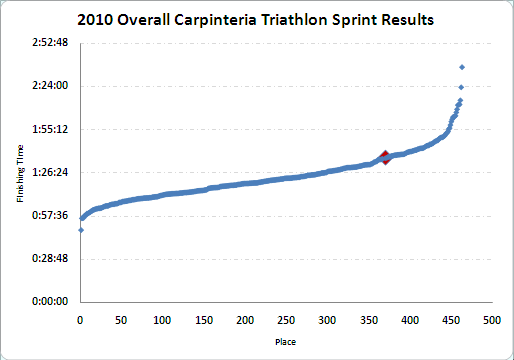 This entry was posted in analysis, inspiration, Results, Triathlon, Triathlon Charts, triathlon training and tagged Carpinteria Triathlon, Results, Triathlon. Bookmark the permalink.